The mother of the Theotokos, St. Anna is being attended by handmaidens. 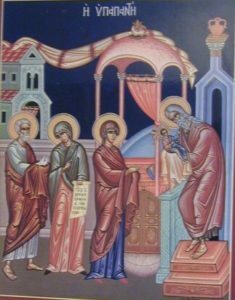 Her father, St. Joachim is attending to the Theotokos at the lower right. Notice that she appears as a small adult, which is typical in iconography. Notice her very interesting crib….it looks like a building with windows. Yes, it looks like the Temple!  The Theotokos is likened to the Temple itself in our hymnography, as well as our iconography. You might surmise that this is because she was presented to the Temple at a very early age – however, more correctly, since she herself contained the uncontainable God, the incarnate Logos of God…just as the Temple was where the Lord dwelled, she BECOMES the Temple of God, literally. Our tradition tells us that the Virgin Mary was presented to the Temple at 3 years old in order to live there and be attended by the angels. Fr. 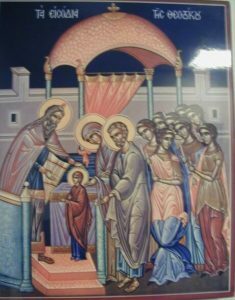 Thomas Hopko, (and others) have taught that this could not have occurred in reality – women were simply not allowed to be IN the Holy of Holies of the Temple. However, since she is considered to be the Temple herself, in a manner of speaking, the event of her presentation, her being “dedicated” to God, has become part of the pious tradition of the Church. 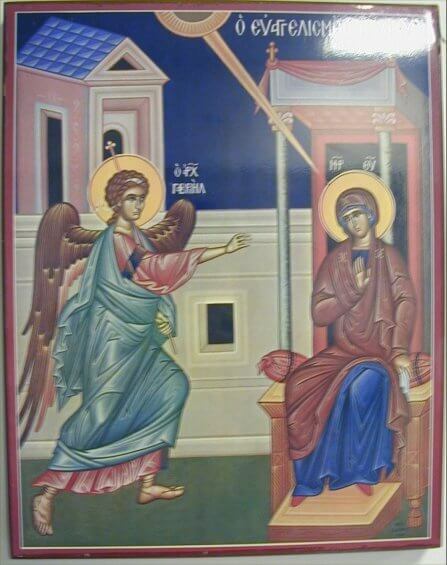 The Angel Gabriel is joyfully announcing (hence, the “annunciation”) the Good News to the Virgin Mary. He is almost dancing! 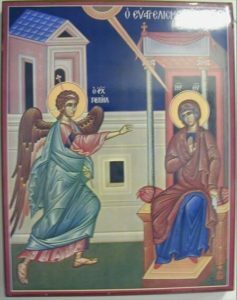 She is already pictured enthroned in this icon. The fabric swag above indicates that this took place indoors. The spear coming out of the heavens indicates that God was fully active in this event, with the focal point of the action being Mary. Notice that they are both facing outward. The Good News being announced to Mary is not only for her, but for all humankind. They are facing us, because this Holy Event is for the benefit of all of US! 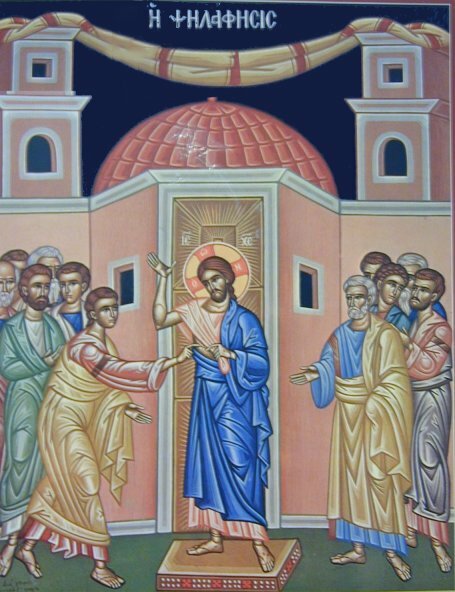 Everything going on in an icon is for the salvation of the viewer. For starters, notice that Joseph is off to the bottom left. This is his proper position in the Nativity icon. 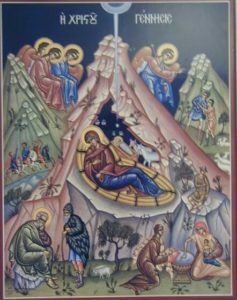 Think of the Gospel account – Joseph is righteous and protects Mary and Jesus, but he is not involved in the miracle of the incarnation of the Son of God. The old man speaking to him represents the devil bringing new doubts to Joseph. Some angels are looking up- glorifying God. Some angels are looking down, tending to the action and ministering. The two women on the right are the midwives which our tradition says Joseph summoned. Whether he really did this or not is irrelevant. 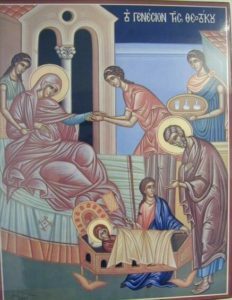 This is here to show that Jesus was born in the normal way and would have needed washing, as a regular human baby would. Notice that the manger is like a casket, (He was born to die!) 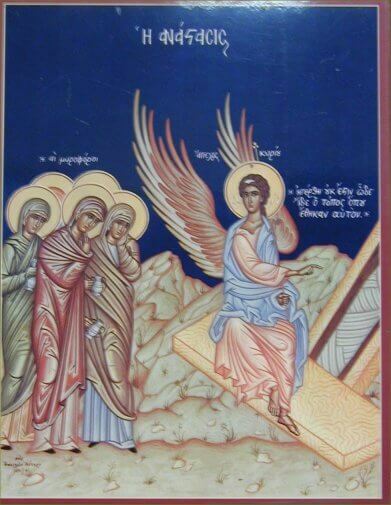 and his swaddling clothes are very much like the grave clothes shown in the icon of the myrrh-bearing women below. The woman (often with a crown and scepter) is a symbol of the sea. 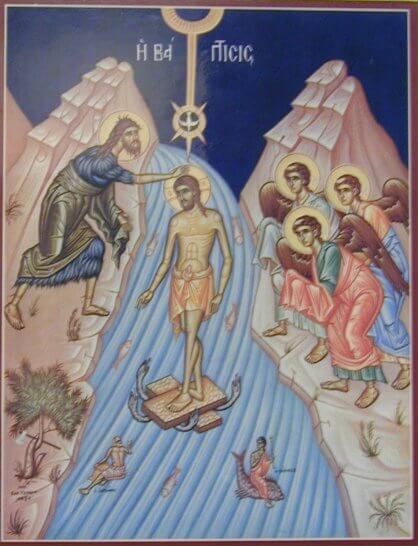 The man (usually holding a water-pot from which water rushes) is a symbol of the river. These two figures are brought into the scene in accordance with Psalm 113 (114) verse 3. “The sea saw and fled, the Jordan turned back”, one of the verses chanted at Epiphany. The angels attend with their hands covered in reverence, perhaps even with towels to indicate Jesus was actually immersed. Angels were not mentioned in the scriptural account and were probably added because their presence was taken for granted and in order to aesthetically balance the composition. Jesus is on Mount Tabor with three of his disciples – Peter, James and John. His glory is revealed. The oval-ish shaped thing behind Jesus with rays emanating is called a “mandorla” which represents the radiance of His uncreated Glory. The three disciples are clearly distressed by the overwhelming vision of the Glory of the Lord! Notice the sandal falling off one of them. This is because this “mountain top” encounter is consistent with Moses ascending Mt. Sinai to receive the Law, where the Lord told him to remove his sandals because it was holy ground, and where Moses ultimately encountered the Glory of the Lord in the burning bush. We have Jesus and his disciples arriving from the left into Bethany (not too far from Jerusalem) As they arrive, Mary and Martha run to Christ and fall at his feet weeping because their brother has been dead for four days, and Jesus could have done something had he arrived earlier. 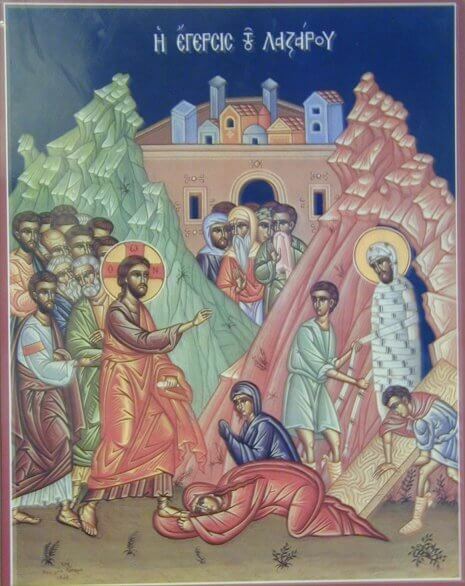 But….at the same time, Lazarus has already been raised by Christ! – so this is not a snapshot of a moment in time, but a narrative of the entire Gospel story about Lazarus. Since he had been dead four days, when Jesus told him to come out, Mary and Martha said there would be a stench. And there was! notice the man holding his cloak across his nose. Lazarus WAS stinky! The harsh reality of death is not avoided here. 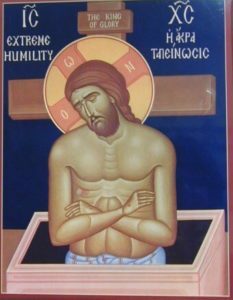 Notice also that Lazarus is still in his grave clothes, even though he is alive. This is because he will use these grave clothes again. Although he was resurrected here, he will die again…Jesus had not yet accomplished the victory over death. 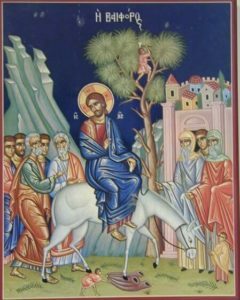 The disciples are entering the city of Jerusalem (shown on the right) with Jesus seated on a donkey. The small figures in the trees and on the ground are children, who are usually depicted as short adults. They are shown waving branches, as described in the Gospels. The twelve are there, including Judas, who is shown reaching. 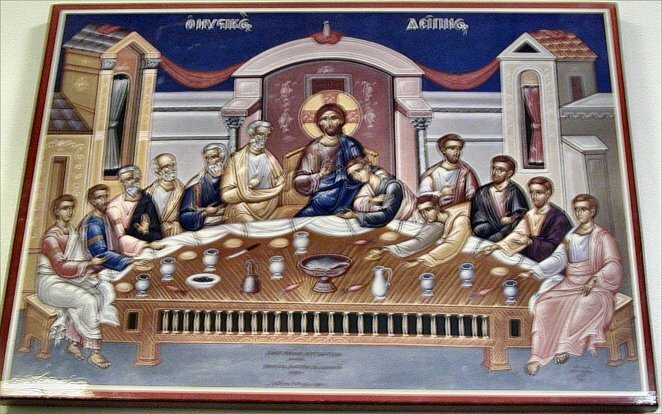 (Often he is portrayed in profile) When the mystical supper icon is depicted on an altar, Judas is usually replaced either by Paul, or by Matthias the successor to his apostolic office. They are indoors. 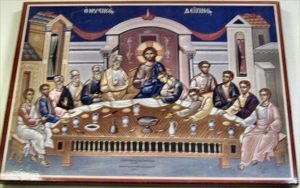 Notice that the table is at its widest part nearest us – we are invited to the table – the Mystical Supper is for US! He is standing within a tomb. The Gospel accounts also differ as to whether or not there was one angel or two, and whether or not he was inside the tomb, or sitting outside on the stone. Notice that the grave clothes are shown here. 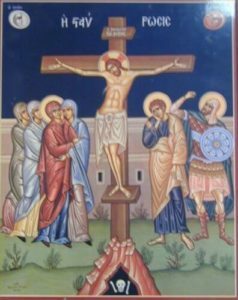 They will not be used again, as opposed to the icon of the raising of Lazarus, in which he is still shown with his grave clothes. 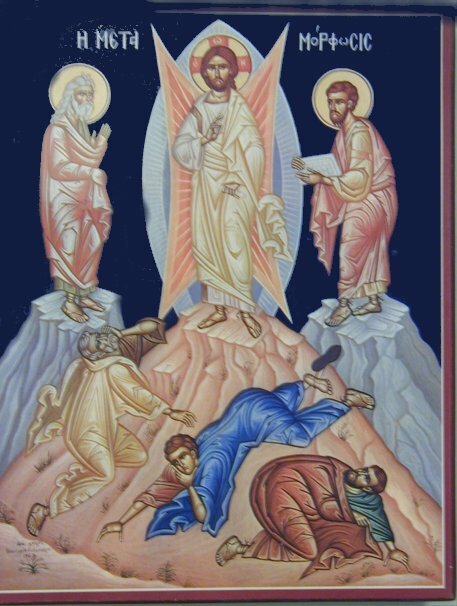 With the Resurrection of Jesus Christ, the triumph over death is final! Christ is Risen! Truly He is Risen! 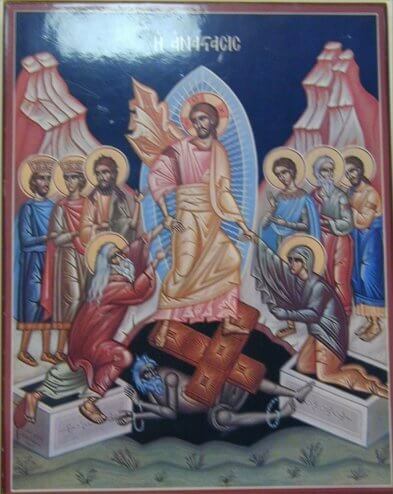 This icon is also called the “Descent into Hades.” Notice that Jesus is standing on the Cross. It is through the power of “the Cross” that Jesus was raised from the dead. Satan is bound in chains, but Adam and Eve are being raised. (Jesus Christ is the New Adam, accomplishing for humanity what Adam failed to do.) Notice also, the mandorla surrounding Christ. His glory is evident through the power of His Resurrection. The other people? John the Baptist and Forerunner is prominent because he preceded Jesus into Hades too, and announced the Good News there! The prophet, King David is also there because he foretold of the coming of Christ and said that Christ would not leave him in Hades. King Solomon is shown by David, because he was the son and successor of David and knew and believed his father’s message. 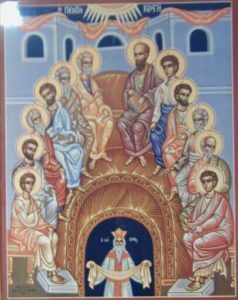 The other two on the right of this icon are Elijah and Moses, representing the Law and the Prophets. 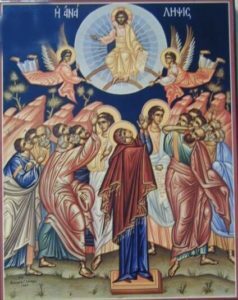 The scriptural account tells us that after 40 days, when the followers of Jesus, (including the women), were looking up at him ascending into the clouds, two men in white (angels) came to them and asked them why they were looking up! Remember that Jesus said he would return exactly as he ascended….so this is our icon both of the Ascension after 40 days, the Jesus second coming at the end of time.  The Theotokos is standing just under Christ, representing the entire Church as a whole – representing US too – waiting for Jesus’ return. Also, the bald guy on the right, wearing a rose-colored robe is St. Paul, who at the historical time of the ascension, was still “Saul” and just about to begin persecuting Christians. He couldn’t possibly have been there at the ascension – so here he is also a representative of the Church, awaiting the return of Christ. Acts 2….There is calm, unity, peace in this icon. When the Holy Spirit comes, order abounds! The Spirit is the Spirit of Unity! (NOT the crazy shenanigans we see and hear about in modern-day Pentecostal gatherings!) The 12 were given tongues of fire which allowed them to preach in many languages. You can see the fire represented in each halo. They were heard preaching the One Gospel, but in many languages. 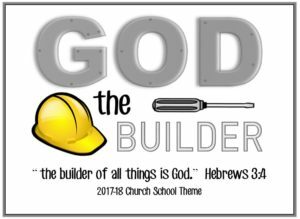 In other words, if someone had come into the room, that person would have heard the Gospel in his or her own language – not a garbled mess of 12 confusing tongues competing for air time – but One Truth. Who is that funny guy underneath? 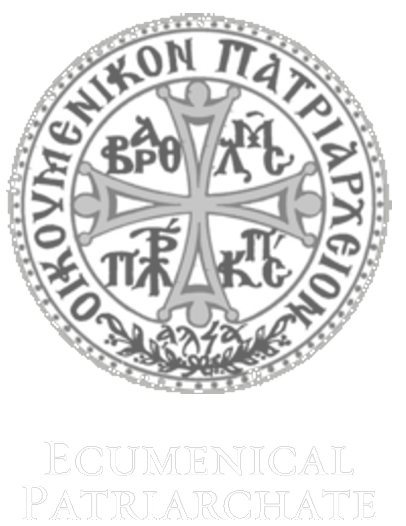 He symbolizes the inhabited world (oikoumene in Greek) pronounced “eekoumenie”, and the cloth he is holding with 12 scrolls symbolize the teaching by each one of the twelve Apostles which would take place in all parts of the inhabited world.